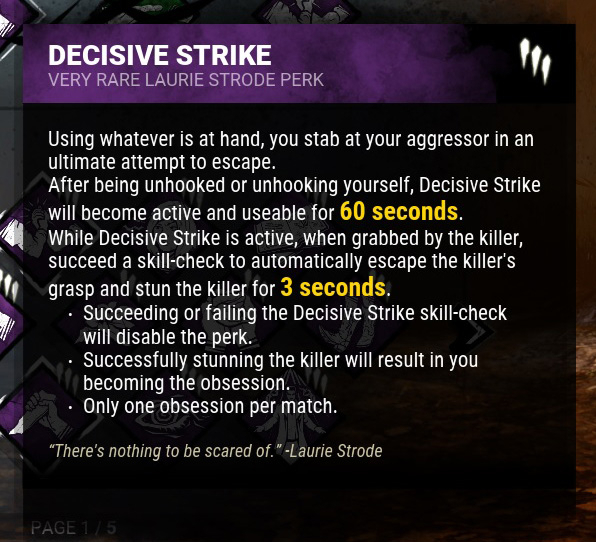 Decisive Strike is one of Laurie Strode’s unique perks, which was released with Chapter II: HALLOWEEN in October of 2016. We introduced Decisive Strike as a perk option to help give Survivors a second wind, and an opportunity to escape their inevitable demise. 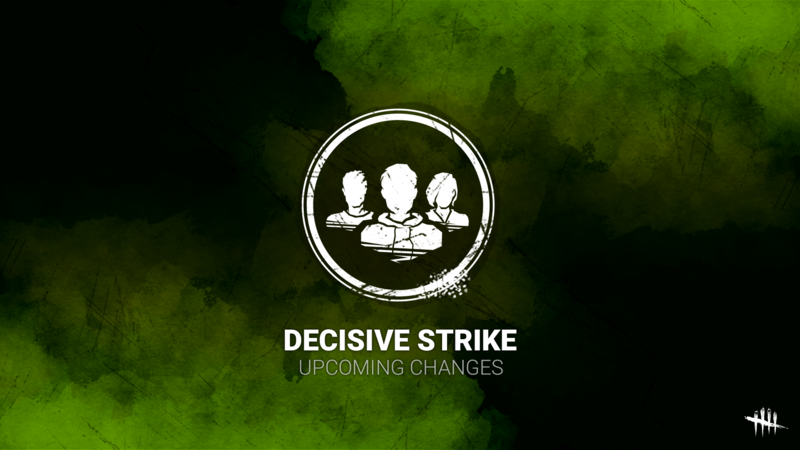 Over the course of the last few years, Decisive Strike has been a point of contention amongst our community, and as a result, the perk has had an interesting journey since its inception. Decisive Strike has gone through some minor changes to arrive at its current state. Additionally, we have also prototyped entire reworks of the perk, some that we previously spoke of with the community. Ultimately, most of these ideas were shelved as we felt that they did not retain the essence of the perk, nor did they provide an overall improvement to the current version. Up to four Decisive Strikes in a match: This perk can take a lot of the Killer’s time and completely break their momentum. In combination with other frustrations, this often comes back as a point of resentment for most Killers who face a Survivor team with Decisive Strike. Risk/Reward: Not much of a downside using the perk, yet a huge advantage when used successfully. Dribbling: This is when the Killer intermittently drops a Survivor to avoid the Decisive Strike trigger. Obsessions: With only a handful of Survivor obsession perks available, it was often clear when at least one Survivor was running Decisive Strike. Killers would tend to actively avoid the obsession, or alternatively tunnel the obsession, forcing them to burn the perk early in the match. For the new iteration of Decisive Strike, we have introduced certain conditions and outcomes for using the perk, while retaining the core concept of providing a second chance at survival for those who successfully use it. The trade-off for using Decisive Strike comes at the risk of suddenly becoming the Killer’s latest obsession. The concept of changing the obsession while a match is in progress is something completely new to Dead by Daylight and is sure to create some interesting situations when combined with other obsession perks. Perk starts inactive: No longer usable from the start of the match on a first down. New condition: In a trial, any Survivor that has the perk equipped can activate and use Decisive Strike if they meet the condition - being saved from a hook or unhooking themselves. Decisive Strike will only stay active for 40/50/60 seconds after being unhooked. This window of opportunity (gag) gives the Survivor only a limited time frame in which to trigger the perk after escaping the hook. Decisive Strike skill checks will trigger during the pickup. This decision was made to help avoid dribbling and reduce the amount of time wasted for the Killer. The skill check area will be slightly larger to make it considerably more accessible to those who occasionally struggle with hitting skill checks. Stunning the Killer with Decisive Strike will result in the Killer dropping the Survivor. After successfully using Decisive Strike, you will immediately become the obsession. This will remove the obsession from any other player, and any perks that refer to the obsession will now refer to you. We believe these changes should help enrich the player experience for both Killers and Survivors. We’re excited to get your feedback regarding our new and improved Decisive Strike perk. These changes will be implemented in the next update. Can a player use DS more than 1 time per match? Do you lose the chance to use DS if you aren't using it on the first carry? No you do not, the perk is disabled only when you miss or succeed the DS skillcheck. Does the timer continues when in dying state / being healed? Yes. The timer acts like the timer from Make your Choice or We'll Make it for example. These changes will be implemented in the next update. They will be available in the next Player Test Build as well. Why shorten the killer stun? 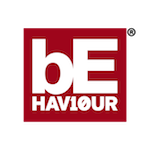 We will be looking closely at feedback and interactions from the PTB to decide if we need to adjust the stun time. DS change happened, how about NOED changes? We aren't planning to change NOED at the moment. We consider that NOED has multiple gameplay counters and is currently in a good place. We do not think of NOED as an equivalent to DS. How does the DS changes affect the other Obsession perks? Increases your chance to become the obsession. Transfers the Obsession status to the Decisive Strike user when successfully triggered during a trial. Only the active Obsession has the ability to see the killer at a maximum range of 56/64/72 meters. No matter the active Obsession, if a killer with Save the Best for Last hits a survivor who is the obsession they will lose 4/3/2 tokens. The player who is no longer the obsession will be treated as a non-obsession, adding a 5% decreased successful attack cool down per hit. The killer doesn't lose his tokens when the Obsession status is transferred to another survivor unless he hits the active Obsession. No matter who has been the Obsession, if a killer with Play With Your Food chases and lets the active Obsession escape, they will gain a movement speed token until their next offensive action. The player who is no longer the Obsession will be treated as a non-obsession, meaning that activating a chase with a non-obsession and losing the chase will not grant the killer a PWYF token. The active Obsession has the altruistic action speed bonus while they are alive. If the active Obsession is killed, Dying Light's de-buff is applied to all remaining survivors. If, at some point in the trial, another player becomes the Obsession, Dying Lights de-buff will be removed as the Obsession is considered alive again. No matter the active Obsession, hitting the Obsession will add +5 seconds of Exit Gate opening time up to a maximum of 20/25/30 additional seconds. All additional seconds are kept when the Obsession is killed, and if the active Obsession changes. The active Obsession always ignore the extra door opening times. They are not affected by Remember Me. The active Obsession will be revealed for 5/4/3 seconds when a generator is completed. The non-Obsessions, even one that was recently the Obsession, will have their locations revealed for 3 seconds after a generator is completed. Once all generators have been completed, the active Obsession will be exposed and can be killed. This is true for any active Obsession which means that the Rancor mori can potentially be used up to 4 times. Stalking the active Obsession grants more stalks points per second. Only active at the start of the match. Will not reactivate when the Obsession changes. Today we did a Q&A session on discord with Stefan Horvath about the upcoming changes on Decisive Strike. So here are below the answers given by our Game Designer/Stefan Horvath. Question: What led to the decision to put the timer on Decisive Strike? Question: Are these changes final? Question: Why the timer? Doesn’t that just encourage the survivor to get downed again just to have a perk? Horvath: Well, it depends on how you see it. You only disable Decisive Strike if you've successfully hit the skill check, or if you tried to hit the skill check and failed. Therefore the timer serves as a window to use the perk, but not to lose the perk. Question: Doesn’t the change to DS make it very similar to borrowed time and kind of redundant in purpose? Question: Have you considered making it so Enduring doesn't apply to DS stun, now that the stun lasts 3 seconds? Question: About the DS changes, wouldn’t these changes punish killers if they find the same survivor and or during a killer's snowball? Horvath: There is definitely a possibility that this happens, I deliberately ran to the killer and was downed/ picked up to just get my DS off and it definitely affected the tide of the game. But ultimately, we have tried to mitigate the amount of time DS wastes in respect to the killer, having the skillcheck occur during pick up and no longer having the non-obsession wiggling out at 35% will save a lot of time. Question: Thanks again for being here it's really nice that you take the time to be closer to the community. When you started the discussion about DS, what did you have in mind ? Did you wanted to straight up nerf it or just change/adjust it ? Horvath: Decisive Strike has been a topic of conversation for a long time, we have entertained several iterations in the past. I will see if I can go into the interations. Ultimately, when we look at balancing the game we try and offer an experience that is fun for everyone, while understanding that one side is trying to kill the other :P. There are definitely frustrations, and we are constantly looking to make this more fun and enjoyable for everyone. Question: Should the stun not be longer (original 5 sec) if the Survivor who used DS was already the Obsession to give them extra time against like for example a black box Freddy? Question: Isn't this DS change a nerf to Dying Light? Since the obsession changes and is therefore alive when a new obsession is chosen? Horvath: This will definitely affect Dying Light if survivors choose to proc DS at the right moments. Depending on the gameplay and decisions made a survivor team could reverse the effects of Dying Light, until another obsession dies. I think the new obsession interaction should be quite interesting, and I look forward to how you guys use it. Question: Could you confirm that rancor won’t be an insane perk because of the new changes? Question: Why doesn't the timer only progress when you're in a hunt? I mean, wouldn't that be balanced? Question: Will the size of DS' skill check remain the same? or will we be seeing a bigger chance due to the change to it? Horvath: The skill check is going to be slightly larger than the first tier overcharge skillcheck. Question: Does it feel good to make a change to a perk that has plagued both sides of the community, killers and survivors, for so long? Horvath: We will see how it works out in the wild, I believe we as a team enjoy to work at making this game more pleasant and interesting for everyone. Question: I have very interesting question to you and your team but i don’t know you want to say that to us. We will get Decisive in PTB, so there is my question - PTB will come to us in Tuesday? Horvath: I unfortunately cannot tease you with the date! But I am excited for you guys to try it out. Question: What do you think about all killers perks like "play with your food", "rancor" or even "remember me"? Isn't the new DS a kinda huge nerf for them? Horvath: It depends on which perk you are running, Rancor could end up with multiple moris on multiple survivors, Play With Your Food may change your mentality, and you may lose the chase with the survivor to gain a token to chase someone else down. Remember Me will allow you to trigger more time on the door if you have not reached maximum stacks. Horvath: I think it's an interesting question, I focus on many aspects not just improving perks, perks can sometimes be easier to adjust in comparison to large components of the game and they definitely add value to replayability and keeping things fresh. Question: Does this mean dribbling a survivor serves no purpose? Good on BHVR to remove that. Question: With how short game time is if survivors choose to optimally complete their objective, isn't DS still a perk that grants too much ground, and now encourages 4 people to run it in a game since everyone gets the same effect regardless of obsession status? Horvath: I am quite excited to see how we behave with the new Decisive strike Changes, I am not sure everyone will run it, I am also wondering if some killers will even see DS proc if they do not tunnel. The 60 seconds does allow for enough time to find a killer after being unhooked, but I believe it will come down to a smart strategy in that case. Question: Do you have any plans at the moment to adjust the other Obsession perks, since the obsession-switching has such a drastic effect on that mechanic? Horvath: All perks can possibly change depending on what ideas we have for them, if they fit and depending on how the community views them. The Obsession mechanic hasn't had many updates so far, so it is possible more changes will come for them. Question: Out of curiosity, What has been the general reaction to the new decisive strike changes? Horvath: There have been a lot of emotions, I believe there have been more than a few people who have wanted DS changes and even more who are unsure whether they like or dislike the changes. I am personally excited to see what happens when it is released. Question: Has it been asked yet if the DS timer will continue to count if BT is applied? I'm assuming both timers will run simultaneously? Horvath: I am not 100% sure, they should be both running simultaneously imo. Question: Does the 60 Second timer introduced with the rework still run when in the dying state? Meaning can a killer just slug the suspected DS user to wait the DS out? Question: So you can no longer save DS? once you miss it, it's a wrap right? Question: Why does DS have to make the survivor the obsession? Am I missing something? Horvath: We thought it would be an interaction that the players would enjoy, it was not necessary. Question: Is the timer still something that BHVR will be looking into? DS's effective time zone seems incredibly small as of right now and easily countered by simply slugging for a minute.